VPN can be quite useful! There are a plenty of reasons why we need a VPN. Not just for security, but VPN helps gain access to restricted websites, hides browsing history from network providers, and keeps our data safe and secure from prying eyes. So, how does one setup a VPN on Android TV? Unfortunately, in case of Android TV setting up VPN doesn’t come as a stock option, we have to set it up explicitly instead. Well, don’t worry! Here are a few workarounds that might do the job. Must Read: How VPN Service Helps Your Mobile Device? 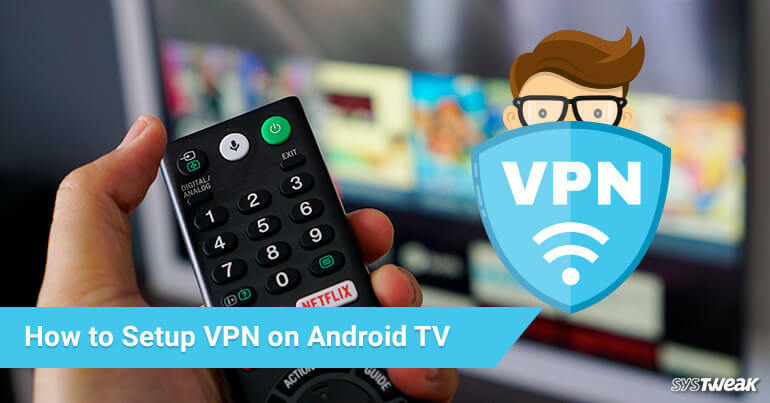 Let’s check out a few ways on how to setup a VPN on Android TV. Some VPN standalone app options come along with the network provider’s service too. For this all you need to do is install the application, sign in to your account and it’s done. You’re then good to go! Doing this will allow you to use VPN on your Android TV. However, if you’re not that lucky then you might have to try the OpenVPN app. This will solve the issue for majority number of times. But the process of setting up is comparatively lengthier. Let’s proceed towards our next section and see how to setup OpenVPN on Android TV. First, create an account on any Open VPN app. As an example, we’re creating an account on Strong VPN which is quite reliable. 3. Once you’ve installed everything on your Android TV launch Google Chrome and then log into your VPN provider’s official website. 4. The next step in the process involves downloading the configuration file. Each VPN app has this somewhere in the settings. As we’re using StrongVPN in this example you’ll find it under Customer Area>Setup Instructions. 5. If you’re using Google Chrome for the very first time on your Android TV, you’ll be asked to grant permission to the app for writing files. Go ahead and proceed further. 6. Once the configuration file has been installed, launch OpenVPN for Android. 7. Now with the help of your Android TV’s remote, tap on the small box icon in the top menu. It’s the import option. 8. Select the configuration file you previously downloaded. After it loads, navigate over to the check mark in the upper right corner and select it to save the config. 9. Tap on the file name to enable it. 10. Input your username and password and proceed further. 11. Once the connection is authenticated tap on OK to start availing VPN services on your Android TV. That’s it folks! Now whenever you wish to use VPN on your Android TV simply jump and launch the Open VPN app. Yeah, we know the process of setting it up is a bit lengthy but isn’t it worth the effort?